OUR LOVELY FRIEND JERMAINE BROWNE & NewYorkinas-Originals! The NewYorkinas-Originals GREENWICH VILLAGE model is made of beige colored cowhide leather what Jermaine Browne hast Customize with his name at the Velcro-strap. The main detail of these shoes is the Velcro-strap around the shoe-tongue. 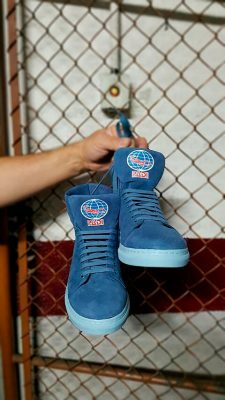 Don´t forget the brand identity on all NewYorkinas-Originals sneakers are the Blue Sole. 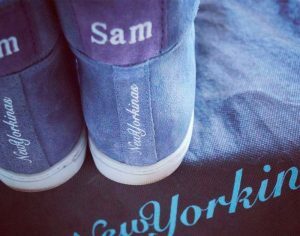 In Barcelona Spain, David Sugrañes has customized his NewYorkinas-Originals with his name embroidered on the back heel of his NYO sneakers and the LOGO of PADI. His NYO sneakers are made of blue suede leather with our brand identity: blue sole. 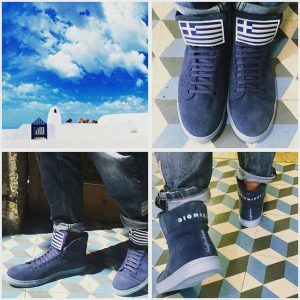 Customize your NYO sneakers! Thank you David for trusting in NewYorkinas-Originals! Fashion photographer Kiko Romano has joined the NewYorkinasOriginals lifestyle and ordered a customized NYO model. His name is displayed on the back-side of the Sneakers and the flag of his home country (Portugal) is on the shoe-tongue. They are one of a kind and an absolute show-stopper, countless people have commented on its eye-catching design. Get your own customized NewYorkinasOriginals, which highlight and emphasizes your personal style. We are happy to give you “The Sky Line at your feet”. In New York USA, Athena Diamond has customized her NewYorkinasOriginals with her name embroidered on the back heel of her NYO sneakers and the flag of her country. 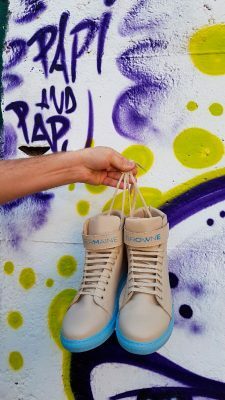 Her NYO sneakers are made of blue suede leather with our brand identity: blue soles. Make NewYorkinasOriginals a part or you! Embroider your name at the back heel of NYO. Choose your flag or logo. More details and info in our Email feedback. On customized models: No returns or refunds are accepted.